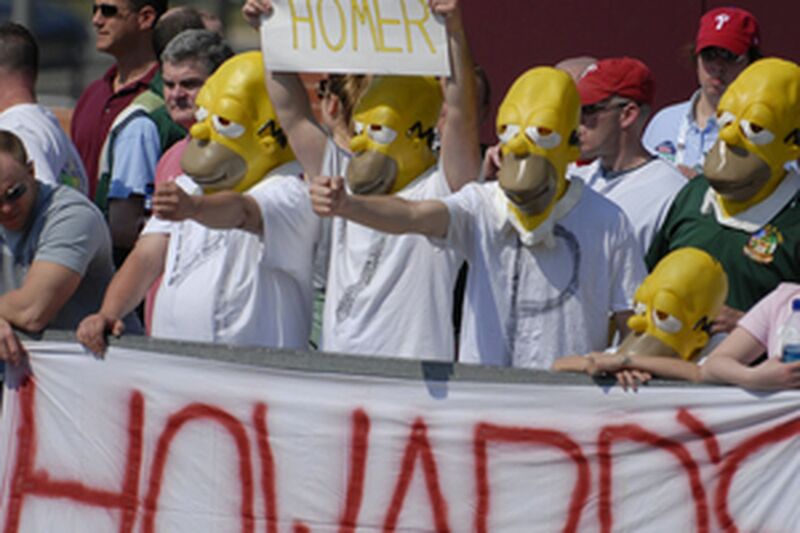 Fans calling themselves Howard's Homers wear special masks as they cheer Phillie phenom Ryan Howard at the ballclub's home opener against the Atlanta Braves yesterday. His wife Amanda was due to give birth to their first child at any moment in Ship Bottom, N.J., but that did not keep Joe "No Last Name, Please!" from yesterday's Phillies home opener. Cheering with his childhood pals in the sold out, sun-baked, beer-soaked, standing-room-only section of the center field upper deck, the 33-year-old teacher said, "These are the guys I grew up with." "These are the guys he got older with," corrected Dave Talbot, a Toms River optician. "I don't know about 'grew up.' Not all of us have wives at home about to give birth." Joe said he did not realize when his friend Brian Mincel bought the tickets in February that Amanda's due date and the home opener were the same. Mike Jones, a personal trainer with the Popeye arms to prove it, said, "I've been Joe's best friend since we were three. He was best man at my wedding. So how come Brian was best man at his?" Everyone pondered that until Joe said, "Mike's had eight hotdogs and it's only the sixth inning. And he's a personal trainer." Everybody laughed and drank ice cold beer. Joe said Talbot's brother, Mike, was treated to a ticket in exchange for being the designated driver in case Amanda called and said, "Baby! Now!" But the call never came so the Long Beach Island crew stayed through the bitter 10th, when the Phillies succumbed, 5-3. The loss did not dampen the spirits of Randy Farrow, 30, a TV repairman from Magnolia, Del., and creator of Howard's Homers - a flock of Phillies diehards who wear huge Homer Simpson masks whenever Ryan Howard bats. "There've been other groups - Ryan's Lions, Ryan's Rhinos - but none of them caught on," Farrow said. "I was trying to think of a name when I said to myself, "What does Ryan Howard do best? Hits homers. D'oh!" The first time Farrow, his brothers Kenny and Jeff, his nephew Logan, 10, and his pal David Wardwell showed up in Homer masks - for a September doubleheader against the Braves last season - Howard hit three homers. During the break between games, Howard pointed up at the Homers in right center field. After the game, he dubbed them "Howard's Homies" and autographed their masks. "He's down to earth like nobody you ever met," said Farrow as his fellow masked Homers nodded. Not far away, Pat Snyder and 40 of her closest friends from Delaware County were standing and cheering as they have for the past 12 Phillies home openers. "I'm wearing my Phillies charm bracelet," Snyder said, showing it to a reporter. "I'm wearing my Phillies socks," she said, showing them. "And she's wearing her Phillies underwear," said Snyder's friend Mary Klagholz. "Wanna see?" For 25 years, they've played softball together for Julie's Tavern, in Glenolden, shot darts together and loved the Phillies together, Patti Watson said.